That said, I’m infamous for over-committing and never saying, “NO!”…so I’ll probably be Turkey Trotting and trying to put out the most amazing meal ever Thanksgiving afternoon. Isn’t that what the holidays are all about? His response: broccoli-cheddar casserole with Ritz cracker topping. And gobs of cheese. Our cousin makes it every year for Christmas and it’s so very good in all the wrong ways. Guilty pleasure much? His response: tortellini – his family’s tradition. Homemade tortellini in a most amazing broth with freshly grated cheese. So, so delicious. But, he’ll have to wait for Christmas for those this year. Good thing it’s a Thanksgiving AND Christmas tradition in his family. His response: Tortellini is traditional in my family. Yeah, we weren’t making much progress. Good thing I’m in charge. 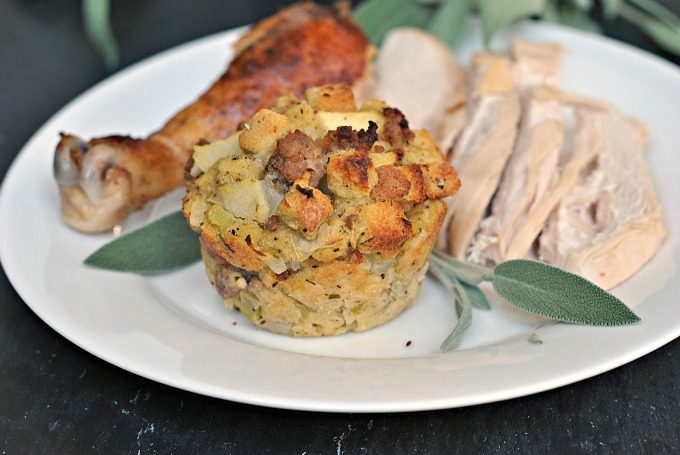 The one thing I HAVE to see on the Thanksgiving table is stuffing. I joke that stuffing is kind of like chili – everyone has a preference as to how they like theirs and my stuffing absolutely, positively must have 1) sausage, 2) apple, and most importantly, 3) sage…garlic, too! 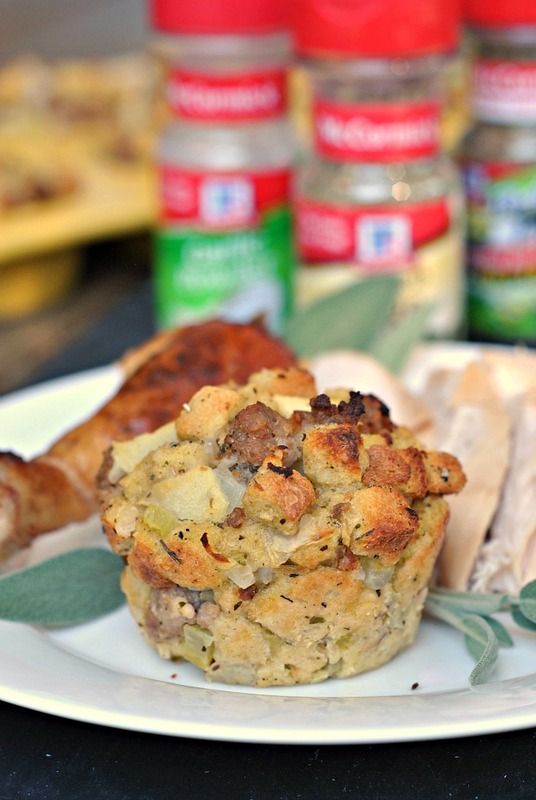 McCormick agrees that stuffing is all about the spices! 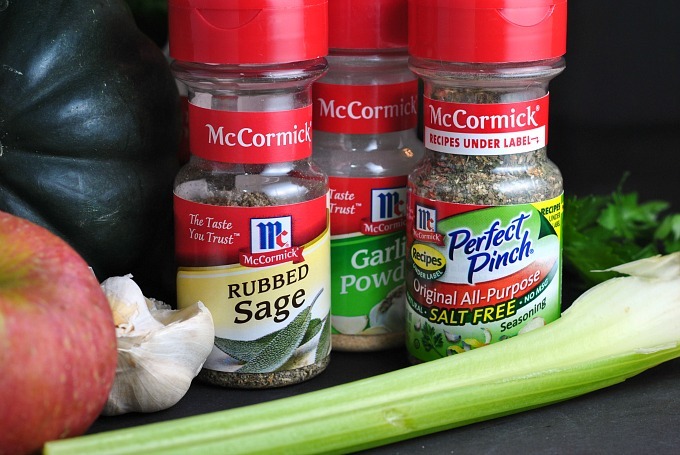 Sage so perfectly complements the other ingredients – onion, garlic, apple, sausage….mmm! Thanksgiving and sage are synonymous and there’s no better place for sage at your Thanksgiving table than in the stuffing. If you’re traveling this year, you may be assigned a dish to bring. My mother-in-law always jokes about being assigned the dinner rolls. She picks out a mean dinner roll in the bakery, let me tell you!! We just love to tease her. But unlike rolls, not all dishes travel well on the day of. Stuffing, however, is very forgiving in that way. You can bake and rewarm covered in foil, or prep and bake at your final destination. Perks: no sloppy messes or ingredients that will stain, and a big bonus of free smells in the car ride. 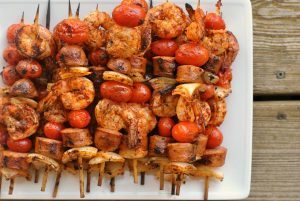 Preheat oven to 375 degrees F. Mist a muffin tin with nonstick cooking spray or line with muffin papers; set aside. In a medium skillet over medium heat, cook the turkey sausage until no longer pink, breaking up with a spatula or wooden spoon. Transfer the cooked and crumbled sausage to a large bowl; return to heat. Add the onion and cook 2-3 minutes. Add the celery and apple and cook until just softened, about 5 minutes. Add the sage, garlic powder, all-purpose seasoning, and black pepper; mix well and cook an additional 30-60 seconds or until fragrant. Transfer the onion mixture to the bowl with the sausage. Add the stuffing; do not mix. In a medium bowl, combine the eggs and broth; whisk well and pour over the stuffing in the large bowl. Using a large spoon, mix well, moistening all of the stuffing. Fill each of 12 muffin wells with the mixture, using your hands to gently press the stuffing into the wells and create slightly mounded tops. Bake for 20-22 minutes or until golden. Allow to cool for 5-10 minute before running a knife around the sides of each muffin well and with a spoon, assisting each stuffing muffin out of the muffin tin. Serve warm. 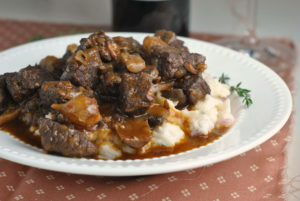 Want a dish easily transported? Rather than making muffins, cook the stuffing in a 9x13-inch dish and increase the baking time to 30-35 minutes, or until golden brown on top. Disclaimer: I was compensated for this post as a contribution to the 2015 McCormick Health & Wellness Blogger Insider Program. All opinions are my own. Wow – those look SO cute. 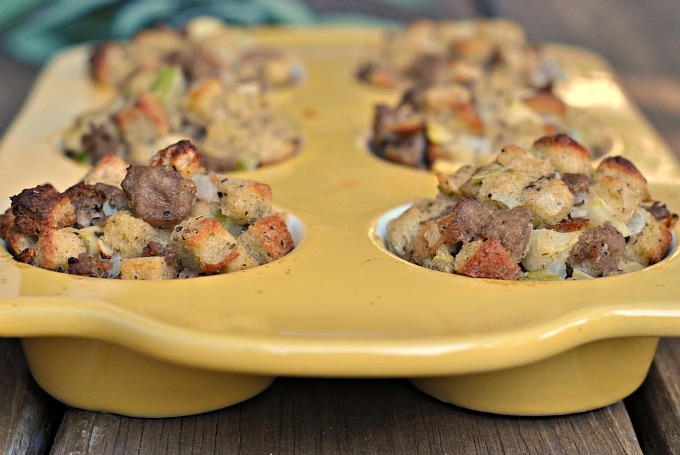 What a great way to present stuffing. I love that everyone can get crispy bits AND soft bits. I bet they taste awesome. I had never had sausage in stuffing growing up, so when we hosted Thanksgiving for the first time and he started cooking sausage I was like “what the hell is that for? !” Now I never make it without – yum! Muffins stuffed with sausage? huh huh. I’ll take that.